Are you looking for a new band saw? Did your old one stop working? Or do you just want to upgrade to a better version? I know that it is hard to pick a model from so many options so I have reviewed a range of different models and have chosen the best one in each price category! 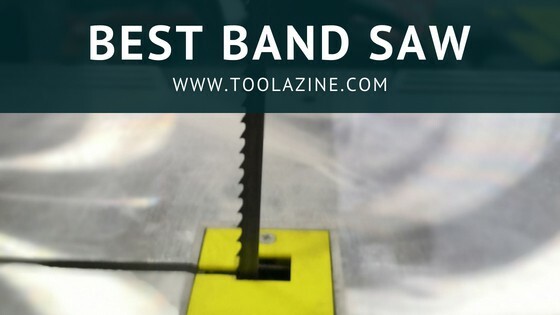 Before we get on with the review, I wanted to mention that these band saws are recommended for professionals and heavy/advanced users and that is why the prices are quite high. One more thing I wanted to say, some higher priced models have better specifications than the cheaper models but that does not always mean quality! And I am going to take a guess that you are looking for a machine that will last you many years! Each specification is pretty important, so take a close look at the comparison table! Overall Top Band Saw & the best band saw for the money! This was a hard decision but I chose the JET JWBS-14DXPRO as my overall pick. The JET JWBS-14DXPRO has a depth of throat of 13.5 inches and a maximum depth of cut of 12 inches! The work table measures 15 x 15 inches and it can be tilted anywhere from 10° to 45°. It comes with a 105 inch blade with a width anywhere from ⅛ to ¾ inches, lastly, the speed of the blade can be set at 1500 feet per minute or at 3000 feet per minute! This item works with a 1.25 horsepower motor! There’s one more thing, this model comes with 5 years of warranty! Go check out the JET JWBS-14DXPRO here on Amazon and on JET for more details! But that is not all! Read the full review below so you can learn a few more facts. This is my overall pick from the whole review! To start off, I want to share with you some background information about JET. If you are a professional then you have probably heard of this company before but here’s the deal: it was founded in 1958 and they have grown a lot since then. Now back to the model, it has a 1.25 horsepower motor. I am going to take a guess and say that you probably think this is pretty low compared to the other models. And yes it is but you can expect a high quality band saw that will last you many years, from this manufacturer. It has a depth of throat of 13.5 inches and the maximum depth of cut is 12 inches. It has a 15 x 15 inch table, which I do agree is quite small! Look here is the thing, there are a lot of models that have a bigger table and a bigger depth of throat; or even a larger blade. However, the quality of construction, with a sturdy cast iron base, arm and wheels combined with the little things like guide bearing on the top and bottom of the saw around the throat and how easy it is to make adjustments of the settings on it make it a very good band saw. I personally know that professionals have high expectations when it comes to the quality of construction of such a big purchase, so this is the best way to go! The table can be tilted 10° to left and 45° to the right. The length of the blade is 105 inches and it has a width of ⅛ to ¾ inches. What I really like about this model is the two-speed system, it can be set at 1500 or at 3000 feet per minute. This feature is pretty important when it comes to detailed work, especially for professionals! But here is the problem: this model does not come with a miter gauge or a rip fence. And this is honestly pretty important, but you do have the option of buying these pieces separately! It has an upper and lower cast iron frame made for increased strength. I give this item 5 stars, it is manufactured by a trustworthy company and it has outstanding customer reviews. And it comes with 5 years of warranty too! Here is a bit about Powermatic: they started out in 1921 and have expanded their company since then. The Powermatic PWBS-14CS has a 13.5 inch depth of throat and 6 inches of maximum depth of cut, which is actually the smallest from the whole review. Like the previous model, this one too has a 15 x 15 inch table but this model comes with an extension which adds 5 inches more! It can be titled 10° to left and 45° to the right. It has a 93.5 inch blade that has a width of ⅛ to ¾ inches, and a speed of 3000 feet per minute. It has a 1.5 horsepower motor that delivers optimum power! And guess what? This is actually the only product from the whole review that comes with a work light, a miter gauge and a rip fence! With this model you will be able to have a clear view of your project! This model has a solid backbone that makes this machine vibration-free! I give this model 3.5 stars, it great features and good customer reviews. As it comes with 5 years of warranty as well! Go check out the Powermatic PWBS-14CS here on Amazon and Powermatic for further details! Let me tell you a little bit about Shopfox, they have over 25 years of experience and they design machines for contractors and DIYers! The SHOP FOX W1729 has 18 – ¼ inches of depth of throat, which is the largest under this price category, and a maximum depth of cut of 12 inches. It comes with a 26 – ¾ x 19 inches work table which can be tilted anywhere from 5° to 45°. It has a wheel diameter of 18 – ⅞ inches. This model comes with a 143 inch blade that has a width of ⅛ to 1 inch, and it can be set at two speeds: 1700 FPM or at 3500 FPM. I honestly consider that the two speed system is a great way to work with different kinds of projects. It has a 2 horsepower motor that can get through the hardest woods. This item comes with a miter gauge and a deluxe aluminium fence, which is designed to be lifted off the table quickly and re-positioned with accuracy on either side of the blade. As in for safety features, the fence is secured to the table with two rails fastened to the front and back edges of the table. Sounds great, right? The SHOP FOX W1729 comes with 2 years of warranty, which is not too bad but I recommend you go for a model that comes with 5 years of warranty! I give this model 3.5 stars, it has good features but unfortunately it does not include a work light. Go check out the latest price of the SHOP FOX W1729 here on Amazon and on Shopfox for a few more details! Have you never heard of Grizzly before? Here are some details: it was founded in 1983 and they have a variety of products. The Grizzly G0513X2 has a 16 – ¼ inch depth of throat and a maximum depth of cut of 12 inches. It has a 2 horsepower motor. It has a table with dimensions of 23 – ⅝ x 17 – ¼ inches, which can be tilted 5° to the left and 45° to the right. And one more thing, it has a wheel diameter of 16 – ¾ inches. The length of the blade is 131 – ½ inches and it has a width of ⅛ to 1 inch, which can be set at 1700 feet per minute and 3500 feet per minute. And again with this feature, you will not have to depend on just one speed! And it gives you more opportunities to work on different designs. This model comes with a miter gauge and a deluxe fence. It has upper blade guide adjustments and a blade height scale measurement. I give this item 3 stars, it has good features but I do not think this will please professional woodworkers. And one last thing, it only comes with a year of warranty, which is too little for a machine of this kind. Go check out the latest price of the Grizzly G0513X2 here on Amazon and on Grizzly for more information. For starters let me tell you a bit about Rikon: they are a company dedicated to designing and manufacturing woodworking machinery of the highest quality. Now the 10-326 has a 13 – ⅝ depth of throat, with a 13 inch maximum depth of cut at 90°. It comes with a work table with dimensions of 21-½ x 15 – ¾ inches, which can be tilted all the way to -7° to the left and 45° to the right! It comes with a 111 inch blade that can have a width anywhere between 3/16 inches to ¾ inches. This model has a two-speed system, it can be set at 1445 FPM or at 2950 FPM; and if you ask me this is a great feature because if you want to start at a lower pace and then build up to the other speed, you can do it! This model comes with a 1.75 horsepower motor which provides ample power for tough woods! Now as in for features, it comes with 6 inch rip fence! It has a a quick release blade tension lever which helps blade changes happen a lot more quicker! I do have to say that it unfortunately does not include a miter gauge or work light. This model comes with 5 years of warranty! I give this model 3.5 stars, I really like the fact that it has the two speeds option but the miter gauge issue is a let down. Go check out the current price of the RIKON Power Tools 10-326 here on Amazon and on Rikon for further details! Here are some details about Laguna Tools, it was founded in 1983 and their main goal is to help their customers build personal success stories. The Laguna Tools MBAND1412-175 has a 1.75 horsepower motor. It has 13 – ⅝ inches of depth of throat and a maximum depth of cut of 12 inches. The length of the blade can be anywhere from 114.75 inches to 116 inches and the width can be from ⅛ inches to ¾ inches. And it has a single blade speed. Now as in for the table, this model works with a space of 16 x 21 – ½ inches, and it can be tilted -7° to the left and 45° to the right. This model does not come with a work light or miter gauge; and if you have a look at the comparison table, you can realize that there are models cheaper that this one that include everything. There is one more disadvantage: it only comes with a year of warranty. And like I said before, you should look for longer warranties just to be on the safe side. This model comes with solid cast wheels that are electronically balanced with polyurethane one-piece tires, which are designed to run cooler & last longer than conventional tires. And one more thing, it has a worm gear & pinion that is ultra-smooth and it is engineered to have minimum flex even when fully extended. I give this model 4 stars, it does have some downside but it has good customer reviews. Go check out the latest reviews and current price of the Laguna Tools MBAND1412-175 here on Amazon and on Laguna Tools for a few more details. The Grizzly G0513X2BF has a depth of throat of 16 – ¼ inches and a maximum depth of cut at 90° of 12 inches. The size of the table is 23 – ⅝ x 17 – ¼ inches, and it can be tilted 5° to the left and 45° to the right. The length of the blade is 131 – ½ inches, and it can have a width between ⅛ and 1 inch. Here’s something that I really like about this model, it comes with a two speed option. It can be set at 1700 feet per minute or at 3500 feet per minute. This model runs on a 2 horsepower motor. It comes with a motor break that stops the blade from spinning in 3 seconds, which is not only an extra safety feature but it also saves you a lot of time during your work hours. And one more detail: the wheel diameter is 16 – ¾ inches. Now let’s talk about the features: this model comes with a miter gauge and rip fence and these are the most common features a proper band saw should include. But it does not come with a work light. There is one last disadvantage: it only includes 1 year of warranty and my recommendation is that you choose a model with a few more years. Overall I give this model 3 stars because there are models under this same price category that have better features! Go check out the latest price of the Grizzly G0513X2BF here on Amazon and on Grizzly for further specifications! The JPW JWBS-15-3 works with a 3 horsepower motor that can get you through the hardest woods and makes your life a lot easier when creating smooth edges! It has a depth of throat of 14 – ⅛ inches and a maximum depth of cut of 14 inches. The dimensions of the table are 21 – ½ inches x 16 inches, and it can be tilted anywhere from 5° to 45°. It comes with a blade with a length of 133 inches, and works with a width of ⅛ inches to 1 inch. This model is a single speed product, the speed of the blade can be set at 3100 feet per minute. And if you ask me, this is a pretty good speed for professionals but there a few more higher speeds in the higher priced models, so if this is your case then check out those models below. This product comes with a miter gauge and rip fence but it does not include a work light. Lastly, the wheel diameter is 14 – ¾ inches. I rate this model 3 stars, comparing it to the last model, this one does have some features the other one doesn’t, but this fact works vice versa. And there is one last thing, this model comes with 5 years of warranty. Go check out the current price of the JPW JWBS-15-3 here on Amazon and on JET for further details. The 14 SUV has a depth of throat of 13 – ¼ inches and a cutting capacity at 90° of 14 inches. It has a table with dimensions of 15 x 15 inches and it can tilted anywhere between 15° and 45°. It has a wheel diameter of 14 inches. The model comes with a blade of 125 inches and the width can be anywhere from 1/16 inches to 1 inch. This model comes with a single speed option. And like the previous model, this one too works with a 3 horsepower motor. Unfortunately the 14 SUV, does not include neither a work light or a miter gauge. It does come with a rip fence. And one last thing that does not make me too happy, it only includes a year of warranty. Lastly, I give this product 2.5 stars. I honestly do not recommend this model as a great pick, there are better options in this price range and even under! And thinking of you professionals out there, I don’t think this model will satisfy your needs! Go check out the latest price of the Laguna Tools 14 SUV here on Amazon and on Laguna Tools for a few more details. The G0514X2B comes with an 18 – ¼ inch depth of throat and 12 inches of maximum depth of cut at 90°. It has a work table with dimensions of 26 – ¾ inches x 19 inches, and it can be tilted 5° to the left and 45° to the right. It has a wheel diameter of 18 – ⅞ inches, which is actually the highest under this price category. The length of the blade is 145 inches and the width can be anywhere from ⅛ inches to 1.25 inches. This model can be set at two different speeds: 1700 FPM or 3500 FPM! I know, it sounds amazing. And again like most of the models under this price category, the G0514X2B works with a 3 horsepower motor. This model comes with a miter gauge and a rip fence but unfortunately it does not include a work light. In addition to that, it only comes with a year of warrant. Now let’s take a moment to compare the 3 Grizzly products under this price range; there are not many differences in the specifications of these products so my top pick within these three model would be the G0514X2B! And that is due to the fact that it has a 145 inch blade meanwhile the other two have a smaller blade. All in all I give this model 3.5 stars, I like the two speed system but I would personally look at other models. And one last thing, it only includes 1 year of warranty. Go check out the current price of the Grizzly G0514X2B here on Amazon and on Grizzly for a few more details. The Grizzly G0514X2 comes with a 3 horsepower motor! It has 18 – ¼ inches of depth of throat and 12 inches of maximum depth of cut. Like the previous model, this one too has an 18 – ⅞ inches in wheel diameter. The dimensions of the work table are 26 – ¾ inches x 19 inches, which can be tilted from 5° to 45°. This model comes with a blade of 143 inches and the width can be anywhere from ⅛ inches to 1.25 inches! And it can be set at a speed of 1700 feet per minute or at 3500 feet per minute. This model comes with a miter gauge, a rip fence with scale and a magnifying window! You have probably noticed that these details are pretty much identical to the previous model; the only detail that changes is the length of the blade. I give this model 3 stars. I am not very satisfied with this band saw and you might not be either. And again it just comes with 1 year of warranty. Go check out the the latest price of the Grizzly G0514X2 here on Amazon and on Grizzly if you would like to see a few more details! The RIKON Power Tools 10-342 has a 17 – ½ depth of throat and 13 inches of maximum depth of cut. It has a 21 – ½ x 15 – ¾ inch work table, which can be tilted all the way to -10° to the left and 45° to the right. This model has a 153 inch blade, which is in fact the largest under this price category, and the width can be anywhere between ¼ to 1- ⅜ inches. It has a blade speed of 3280 feet per minute. This model has a 2 horsepower motor; and if I am being honest, there are models in this same price category that come with a more powerful motor. So if your main priority is the power of the band saw then I suggest you have a look at the other models. This model does not come with a worklight or a miter gauge but it does include the an extra tall rip fence. Here is something else: it comes with 5 years of warranty. This model comes with a hinged blade guard with sight window. I rate this model 3.5 stars, it comes from a very reliable company! Go check out the latest price of the RIKON Power Tools 10-342 here on Amazon and on Rikon for further information! This is my overall pick under the $2000 category! This model has a 13 – ⅝ inches of depth of throat and a maximum depth of cut of 14 inches at 90°. It has a work space of 21 – ½ inches x 15 – ¾ inches and it can be tilted -10° to the left and 45° to the right! The length of the blade is 142 inches and the maximum the width can be is 1 inch and the minimum is 3/16 inches. The speed of the blade can be set at 4300 feet per minute. And like the previous model, this one also doesnot come with a work light and miter gauge but comes with the rip fence! And again it does come with Rikons’ 5 years warranty plan! But are you wondering why I chose the RIKON Power Tools 10-353, instead of the RIKON Power Tools 10-342? Well you have probably realized that the RIKON Power Tools 10-342 has a larger depth of throat and blade than the RIKON Power Tools 10-353. But you should also know that the RIKON Power Tools 10-353 has a higher speed and it comes with a 3 HP motor while the RIKON Power Tools 10-342 has a 2 HP motor! I give this model 4 stars, I think this product will satisfy your needs considering how trustworthy this company is! Go check out the current price of the RIKON Power Tools 10-353 here on Amazon an don Rikon for further details! This model has a 3 horsepower motor! It has a depth of throat of 21 – ½ inches and a maximum depth of cut at 90° of 14 – ½ inches. From the three Rikon items under this price category, this model has the largest depth of throat! Sounds great, Right? The dimensions of the table are 19 inches x 30 – ½ inches. The width of the blade must be between ⅜ inches to 1 – ⅜ inches. You can set this band saw at two speeds: at 2296 feet per minute or at 3610 feet per minute. This model only features a rip fence, it does not include a miter gauge or work light. And another thing, this product comes with 5 years of warranty! Amazing, I know! I give this model 3 stars, as unfortunately some customers have reported issues with the build quality. Go check out the latest price of the Rikon 10-380 here on Amazon. This model has 13 – ⅝ inches of depth of throat and 13 inches of maximum depth of cut at 90°. It has a table with dimensions of 16 inches x 21 -½ inches, which can be tilted from -7° to 45°. As in for the length of the blade, this model is compatible with any blade between 114.75 inches to 116 inches. And the width can be between ⅛ inches to ¾ inches, this model has a single blade speed option. I also want to point out the fact that this model is the lightest under this price category, this is an advantage when it arrives home because you will not need too much help to set it up. This model comes with a 1.75 horsepower motor and I know that there are models that have a larger engine but this one gets the job done. Unfortunately it does not come with a miter gauge or worklight, but it does include a rip fence. I give this model 2.5 stars, if I am being honest there are better products under this price range that have better features than the Laguna Tools mband14bx110-175. And another thing, it comes with just 1 year of warranty. Go check out the current price of the Laguna Tools mband14bx110-175 here on Amazon and on Laguna Tools for further details! This is my top pick under the $2500 category. The RIKON Power Tools 10-346 has 17 – ½ inches of depth of throat and 19 inches of maximum depth of cut. The size of the work table is 25 x 19 inches and it can be tilted -5° to the left and 45° to the right. The length of the blade is 165 inches and it can have a width between ¼ of an inch and 1 – ⅜ inches. The blade speed can be set at 4920 feet per minute! Which is actually the largest blade I have reviewed so far! Sound great, Right? This model runs on a powerful 4 horsepower motor! Which is also the most powerful motor until now! Here is a fact: there are only two models in this review that include a work light, and guess what? The RIKON Power Tools 10-346 is one of those!! It also comes with a rip fence. But here is the thing, it does not include a miter gauge. But are you asking yourself why I prefer this model instead of the JET 708749 JWBS-16? Well if you look at the comparison table, then you can clearly see that the RIKON Power Tools 10-346 overanks the JET 708749 JWBS-16 in depth of throat, cutting capacity, table size, blade speed and length and lastly the motor! I give this model 3.8 stars, Rikon is a great company that you can rely on. And one more thing, it comes with 5 years of warranty. Go check out the latest price of the RIKON Power Tools 10-346 here on Amazon. This model has 10 – ¼ inches of maximum depth of cut at 90° and 16 inches of depth of throat. It has a work table of 17 inches x 17 inches, and it can be tilted from 10° to 45°. The JET 708749 JWBS-16 works with a 123 inch blade which can have a width between ⅛ and 1 -½ inches; the speed of the blade can be set at 3000 feet per minute. And in my opinion 3000 FPM isn’t too much considering this model is a quite expensive. It comes with 1.5 horsepower motor. Here’s the deal: this model does not include any features like the previous models, are you not sure of what those are? It does not come with a worklight, miter gauge or rip fence. One more thing, it only includes one year of warranty. I give this model 3 stars, and here’s my personal opinion: considering that this model is manufactured by JET, professionals like you have high expectations but this product does have a few letdowns. Go check out the current price of the JET 708749 JWBS-16 here on Amazon. This is my top pick in the under $3000 price range! The W1770 has 20 inches of depth of throat and 14 inches of maximum depth of cut at 90°. It has a wheel diameter of 20 – ¾ inches. The length of the blade is 165 inches and it works with a width between ¼ inches to 1 – ⅜ inches; the speed of the blade can be set at 4600 feet per minute. The dimensions of the table are 29 – ½ inches x 20 – ¾ inches, it can be tilted 5° to the left and 45° to the right. This model has a 5 horsepower motor and that’s actually the most powerful motor reviewed until this product! Isn’t that great? Regarding the features, this model includes a miter gauge and a rip fence but unfortunately it does not come with a work light. It comes with precise adjustments with the micro-adjusting rack and pinion table tilt. Lastly it has a dual-position resaw fence to provide maximum support for resawing wide boards or re-position the fence within seconds. One additional thing: it comes with 2 years of warranty, which is not a lot in reality. I give this model 3.5 stars, it has good specifications but I suggest you look at other models if this does not satisfy you. Go check out the latest price of the Shop Fox W1770 here on Amazon and on Shop Fox for further details. The Grizzly G0531B comes with 20 inches of depth of throat and 14 – ¼ inches of maximum depth of cut. It has a work table of 29 – ½ inches x 20 – ¾ inches, which can be tilted 5° to the left and 45° to the right. It has a wheel diameter of 21 inches. The blade measures 165 inches of length and the width can be anywhere between ¼ of an inch to 1- ⅜ inches! The blade speed can be set at 4600 feet per minute. And like the previous model, this one too works with a 5 horsepower motor! The G0531B includes a miter gauge and rip fence! If you look closely at the Grizzly G0531B and the Shop Fox W1770, you can notice that the specifications are pretty much the same. So why do you think I prefer the Shop Fox W1770? The Shop Fox W1770 comes with 2 years of warranty instead of 1, I find this detail quite important considering the price of these models! I give this model 3 stars; I do not think this machine is fit for all you professionals out there; I suggest you look at other models! Go check out the latest price of the Grizzly G0531 here on Amazon and on Grizzly for for a few extra details. This model has a depth of throat of 24 – ½ inches and a maximum depth of cut of 16 – ¼ inches. It has a work table with dimensions of 23 – ⅝ inches x 33 – ½ inches, and it can be tilted up to 45°. It works with blades of 181 inches of length, meaning the width can be anywhere from ¼ inches to 1- ½ inches. The speed can be set at 5300 feet per minute. Here’s a fact: this model runs on a 7.5 horsepower motor. But let’s pause for a second, I know you are probably thinking that this model is the best because of the specifications; I do agree that it has a large blade and a powerful motor but my suggestion is that you look at the models reviewed previously! And the reason I am recommending this is because the Grizzly G0569 might not meet your expectations when put at challenges. This model includes a miter gauge and an exclusive rack-and-pinion table tilt which assures your cuts will be accurate. I rate this model 3.5 stars, remember that just because an item is expensive, that does not mean it will have great quality. One last thing: this model comes with 1 year of warranty. Go check out the current price of the Grizzly G0569 here on Amazon and on Grizzly if you wish to see a few more details. The Grizzly G0568 has 24 – ½ inches of depth of throat and 16 – ¼ inches of cutting capacity! The length of the blade is 181 inches, and the width can be anywhere between ¼ inches to 1- ½ inches. The speed can be set at 5300 feet per minute. The work table has dimensions of 23 – ⅝ inches x 33 – ½ inches, which can be tilted up to 45° to the right. It has a wheel diameter of 24 – ¾ inches. As you have probably realized this model is pretty similar to the Grizzly G0569; but what’s the difference between these items? This model has a 5 horsepower motor while the Grizzly G0569 works with a 7.5 HP motor; if I had to choose between these model, I would pick the Grizzly G0569 just because it is a lot more powerful but I would not recommend these items as my top picks. And again this model includes a miter gauge; excluding the work light and rip fence. I give this model 3 stars, this is not an item I would recommend for picky professionals. And another thing, it comes with 1 year of warranty. Go check out the latest price of the Grizzly G0568 here on Amazon and on Grizzly for further details! This model is my top pick under the $3500 price category! The JET JWBS-20QT-3 has 20 inches of depth of throat and 12 – ¼ inches of maximum depth of cut at 90°. The work table has dimensions of 21 inches x 21 inches, and it can be tilted 10° to the left and 45° to the right. It has a wheel diameter of 20 – ½ inches. The length of the blade is 150 inches and it can have a width of ⅛ of an inch to 1 – ½ inches. This model has a two speed system, it can be set at 1800 feet per minute as a starting speed and it can then be set at 3200 feet per minute. This model works with a 3 horsepower motor. It includes a miter gauge and rip fence. It features computer-balanced band wheels, that employ a flywheel effect that produces smooth cutting action without vibration! Isn’t that great? This model comes with a foot brake in order to make quick blade stops. So you may be asking yourself why I picked this model as the best in this price range. Well in this case it’s a matter of small details, if you had a look at the comparison table then you probably noticed that both of the Grizzly models have better specifications than the JET JWBS-20QT-3. So what makes this item better? If I am being honest, Jet is a more reliable company and the JET JWBS-20QT-3 comes with 5 years of warranty, while both of the Grizzly models come with 1 year. I give this model 4 stars, remember to consider all the details! Go check out the latest price of the JET JWBS-20QT-3 here on Amazon. It has a work table of 21 – ½ inches x 16 inches, and it can be tilted 10° to the left and 45° to the right. The sturdy cast iron table and trunnion assembly offers maximum rigidity for heavy work piece. It has a wheel diameter of 15 inches. The length of the blade is 153 inches and the width can be anywhere between ⅛ of an inch and 1 inch! The speed of the blade is 3100 feet per minute. This model runs on a 3 horsepower motor. Unfortunately it does not include a work light or miter gauge but it comes with a rip fence. This model comes with an oversized side plate that can be used in the horizontal or vertical position. One more additional feature: it has a blade tension release with electrical interlock in order to prevent the bandsaw from starting when the blade is de-tensioned or released. This model comes with 5 years of warranty! Isn’t that amazing? I give this model 4 stars, this product has some pretty great features! Go check out the current price of the Powermatic PM1500 1791500 here on Amazon an don Powermatic for further details! This model has 18 inches of depth of throat and 18 inches of maximum depth of cut at 90°. It works with a 5 horsepower motor. The dimensions of the table are 24 inches x 24 inches and it can be tilted from 15° to 45°. The length of the blade is 160 inches and the width can be anywhere between 1/16 inches and 1 – ½ inches. This model has a two speed option, it can either be set at 1800 feet per minute or at 4200 feet per minute. I personally really like that system because you can start from a lower speed and as soon as you need it, you can set the higher speed. This model does not include a worklight or a miter gauge, but it does come with a rip fence. Unfortunately it only comes with a year of warranty which is really short. It comes with a heavy duty upper wheel support and tracking mechanism for smooth operation. I give this model 3.5 stars, but I do think there are better options for a better price. Go check out the latest price of the Powermatic PM1800 here on Amazon and on Powermatic for a few more details! This model is top pick in this price category! The Laguna Tools MBAND185400 has a depth of throat of 17 inches and a maximum depth of cut at 90° of 18 – ⅜ inches. The table measures 19 inches x 25 inches. It works with a 158 inch blade which can have a width between 1/16 inches to 1- ⅜ inches. This model has a single speed option. It works with a 4.5 horsepower motor. It does not come with a miter gauge or work light but it does include a rip fence. Are wondering why I chose this item over the Powermatic PM1800? The Laguna Tools MBAND185400 is a bit less expensive than the Powermatic PM1800, and there aren’t many differences between these two items! I rate this model 3.8 stars, this item is actually a lot more lighter than the Powermatic PM1800 which is a great advantage at arrival! And like the previous model, this item also comes with a year of warranty! Go check out the latest price of the Laguna Tools MBAND185400 here on Amazon and on Laguna Tools for a few more details! If you are looking for a band saw for a small workshop then I recommend the JET JWBS-14DXPRO it is a professional grade/quality band saw that does not have a very large footprint, making it suitable for a small shop. It is my top price under $1500 and overall as it is great value for money. This model would be well suited to any small and even a medium size shop. Maximum depth of cut at 90°: this specification tells you the maximum height a piece of wood can be in order for you to be able to work perfectly with the band saw. This piece of information can vary in each band saw so you should take a close look in order for you to know if this measurement will allow you to work with no issues. Table Size: this factor is very important because it tells you how big the work table is going to be and if you are a professional then you already have an idea of your average pieces of wood. In case you don’t then have a quick run to your workshop so you can clarify the measurements so you are 100% satisfied when your machine arrives. For those of you out there that work with big pieces, I suggest you pay close attention to these measurements because an inch can make a difference! Table Tilt: this option lets you position the table at different angles in order for you to make the cuts you need. Each model has a minimum and maximum angle you can set it up at and it usually tells you how far to the right or left you can tilt the table. In all of the models reviewed here, you can tilt the table up to 45° to the right and the only number that changes is the left option. Wheel diameter: this piece of information varies for each model and it’s even unknown for some. This measurement tells you the diameter of the wheel and it is usually pretty close to the depth of throat, as it should be in order to avoid fatigue. Blade length: this is highly important when purchasing a band saw. There is a usually a minimum and maximum length the blade of the band saw can work with, as long as you stay within these ranges then you should be fine. Some professionals already have a blade of preference so if that’s your case then you can check these measurements to see if that blade is compatible with the band saw you are planning on getting. Blade width: this element, like the previous one, also has minimum and maximum ranges of width, I would recommend thicker blades for harder woods! Blade speed: in this review there some models with one speed option and there are other with 2 speed options. I personally prefer to work with band saws that have two options and that’s because you get the choice to pick what speed you start with. And you can also perform some detailed work with a lower speed! This is very personal so if you feel that you don’t need to start with a lower speed, then a model with a single speed system should be fine too. Weight: I find this very important because this can be an issue when it gets to your house. One thing I highly recommend is that you always have at least one person to help you, there are some models that are heavier than others but all of them are heavy for one person. So have a look at this piece of information so you can figure out how many people you are going to need beforehand. HP: this is a pretty personal too, the power of the machine is obviously important but just because a model has a smaller motor, it does not always mean that one with a bigger motor is better. Light attachment: as you may have realized there are only two models that have this feature, this is not a decisive detail, it is just an advantage! Miter Gauge attachment: this feature is honestly very important, this allows the band saw to hold the piece of wood at an angle when you are working. Some models include it and others don’t, I suggest you look for one that does. But if you really like one specific model and it does not include this feature, you should know that all of the models come with a miter slot and this means you can purchase the miter gauge separately. Just have a look at the miter slot measurements in order to make the correct purchase. Rip Fence attachment: this feature is basically a fence that guides and helps you make straight cuts. For professional, this feature should not be an issue if it’s not included in the model but you can always purchase this attachment separately. Warranty: as I have mentioned before in this article, I highly recommend you aim for a long warranty. I personally think 1 year is too little, you should consider at least a minimum of 2 years. These are a lot of details to take in but you should know every single thing about your new model! Look through each detail very carefully keeping in mind your specific needs! So what’s the answer? Have you picked your model? My overall pick in this review is the JET JWBS-14DXPRO, this model will complete all the tasks you set it up to and it has good price too! I want to remind you that the models reviewed are manufactured for an advanced level of woodworking and that is the main reason why they are a bit more expensive. If you’re not a professional then I don’t recommend you start with any of these unless you’re supervised.